The penguin looking "Tux Droid" wirelessly connects to your computer though it's "fish" friend and is compatible with Windows or Linux. A fully customizable series of applications means the Tux can act as a music player, news service announcer, event notification, Skype phone, weather forecaster, etc. 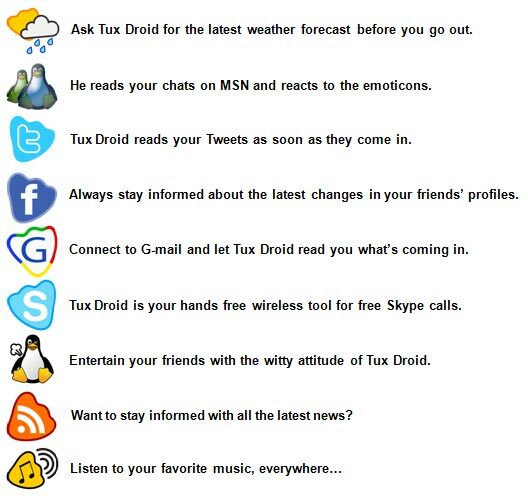 The Tux can read your email to you as it arrives as it has text-to-speech capabilities in more than 10 languages. The Tux comes with a USB cable, an IR remote, a firmware update cable, a power adapter, instruction manual, and a 2.4 Ghz wireless dongle shaped like a fish that plugs into a standard USB port. The Tux Droid can blink and light-up his eyes, swivel on his base, flap his wings, talk and hear, tell how dark it is, sense a push on his head, a push on either wing and accept commands from the included IR remote control. He is fully programmable and customizable at every level, with all of the source code and software used freely available. Tux can also evolve as you either create or download new ways to use him. There are already loads of new add-on "widgets" available from open source communities that add even more functionality. On the right is our "Tux Droid" on display with a few of our other robots. The Tux Droid Robot wirelessly connects to your computer and alerts you of events with lights, sound and motion. Tux Droid can take inputs via sound and touch. Open source software allows for easy programming of Tux widgets. Built in rechargeable battery pack. Includes a wireless 2.4 GHz link. A 800Mhz CPU or faster. Dimensions - 8.5" high x 7.1" wide x 5.5" deep. Chipsets - Atmel AVR RISC microcontrollers. Push button on top of the head. Internal switch sensors in both wings that are triggered by pushing the wings. 3.5mm mono audio socket for audio in. One blue LED in each eye. 3.5mm stereo audio socket for audio out. Rotation to the left and the right. Wireless connection - 2.4 GHz wireless full-duplex digital link between the USB "Fish" dongle and the Tux Droid. Power - NiCad 750mAh battery pack. Our "Tux Droid" on display with a few of our other robots. The Merry TuXmas Droid by Kysoh. Every now and then it will play one of 10 Christmas style tunes. We exhibit these & other robots Free of Charge at schools, science museum's, robotic competitions and science expo's with the hope that they inspire everyone... young & old. Special thanks to Kevin Burns of Synthesis Entertainment.